This research brings an innovate perspective for the analysis of land restitu-tion from the Human Rights Based Approach(HRBA. The Victims and Land Restitution Law 1448, of 2011 is expected to have a profound impact on Colombian society, under the transitional justice framework in which the government’s responsibility and victims’ opportunity to claim their rights is embedded. 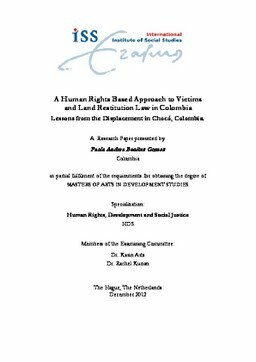 The Constitutional Court ruling about the problem, and its aftermath provide the lessons from the HRBA about indivisibility of rights, participation, land restitution and accountability of the state These knowledge revealed the on-going armed conflict and social exclusion as the structural causes of the continuing violations of the rights of afro-Colombian victims of displacement and dispossession. As well, the lack of effective response of the state to address the problem is not helped by the enabling environment of the Law 1448. In this sense this study contributes to analyse if the Law 1448 represents a HRBA to the land restitution for the afro-Colombian communities and what policy recommendations should take from the HRBA to comply with its human rights obligations.